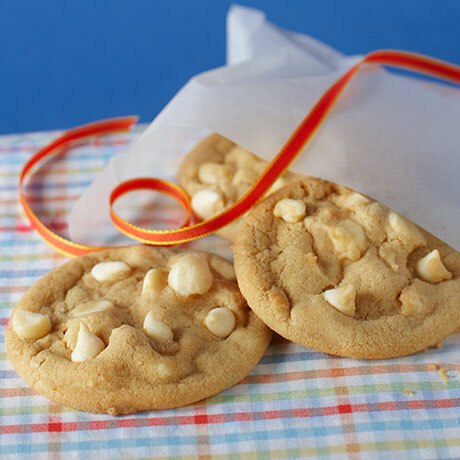 Loads of white chocolate chips and generous chunks of macadamia nuts make every bite of this delicious cookie absolutely unforgettable. Approximately 36 cookie dough pieces. ENRICHED BLEACHED FLOUR (BLEACHED WHEAT FLOUR, MALTED BARLEY FLOUR, NIACIN, REDUCED IRON, THIAMIN MONONITRATE, RIBOFLAVIN, FOLIC ACID), SUGAR, WHITE CHOCOLATE CHIPS (SUGAR, WHOLE MILK POWDER, COCOA BUTTER, SOY LECITHIN [EMULSIFIER], VANILLIN [ARTIFICIAL FLAVOR]), MARGARINE (PALM OIL, BUTTER [CREAM, SALT], WATER, CONTAINS 2% OR LESS OF SALT, VEGETABLE MONO & DIGLYCERIDES, NATURAL FLAVOR, CITRIC ACID, VITAMIN A PALMITATE ADDED, BETA CAROTENE [COLOR]), EGGS, MACADAMIA NUTS, CONTAINS 2% OR LESS OF: MOLASSES, WATER, BAKING SODA, SALT, NATURAL AND ARTIFICIAL FLAVOR.